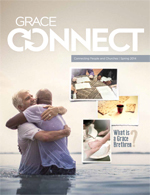 The Spring 2014 issue of GraceConnect magazine has been mailed to subscribers and is now available online. The publication, produced by the Brethren Missionary Herald Company for leaders and individuals in the Fellowship of Grace Brethren Churches (FGBC), is printed quarterly and sent, at no charge, to interested individuals. This issue is devoted to the Identity Initiative, a two-year process led by Dr. Dave Guiles that is examining how members and churches within the Grace Brethren fellowship view themselves and to ensure that moving forward, the FGBC will remain a biblically sound, culturally relevant movement. Individual articles address “So, What is a Grace Brethren Anyway?,” a brief history of the statements that have defined the FGBC, and how the Identity Initiative impacts the Grace Brethren movement worldwide. A digital copy of the magazine (PDF file) may be downloaded here. Stories from the magazine will be posted to this site over the next few days. If you’d like to receive a free subscription to the magazine, click here.